The design of scramjet engines requires that engine components be protected against the severe aerothermal environment associated with hypersonic flight. Passive thermal protection methods, in which temperature- and oxidation-resistant materials are allowed to reach equilibrium temperature levels, can severely tax the maximum temperature capability of available materials. With active thermal protection systems, vulnerable structures are cooled to temperatures at which available materials may be used with confidence. If suitable cooling techniques can be devised, active cooling represents an attractive alternative to passive thermal protection. 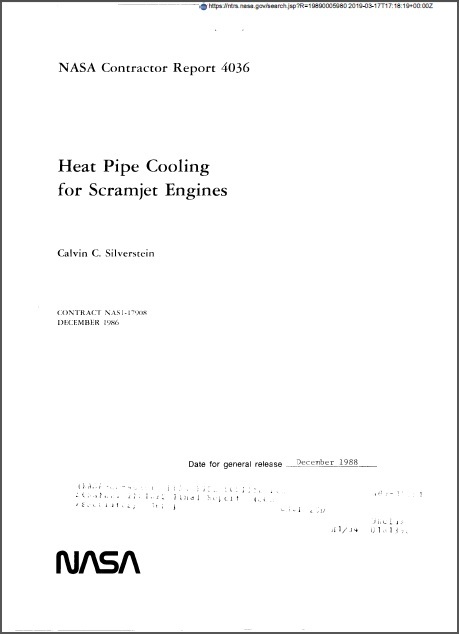 Heat pipe cooling systems which utilize liquid metal fluids are of particular interest as a potential technique for limit-ing the temperature of scramjet engine components subjected to intensive aerothermal heating. With such systems, heat transport takes place automatically, without the use of external power and pumps. High heat transport rates are attainable at elevated temperatures with moderate system pressures, and system temperature drops are minimal.